The only thing better than tasting homemade treats is presenting them as gracious gifts! 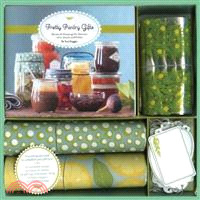 The enclosed booklet offerstechniques on preparing and preserving 15 simple recipes, while the rest of the kit provides accessories for transformingglass jars into tempting treats for family and friends. Tara Duggan is a James Beard Award-winning food journalist and editor at the San Francisco Chronicle.